Jerusalem - The Reebok shoe company released a new sneaker design on Monday in honor of Israel’s 68th Independence Day celebrations. 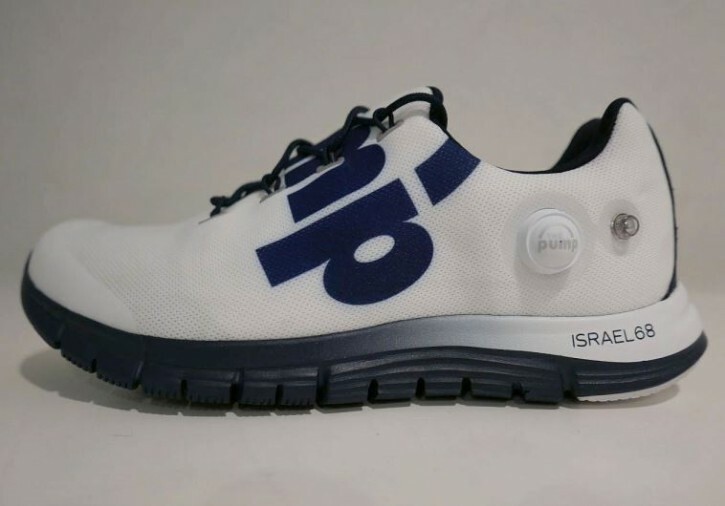 The special edition sneaker is blue and white and has “Israel 68” engraved on it’s heel. Moshe Sinai, the CEO of Reebok Israel, explained that these sneakers were to be a one time celebratory release as a collector’s item in Israel and the world. The Independence Day sneaker features the Reebok “Pump” technology that allows the sneaker to form to the foot of its’ wearer. A push button releases compressed air into the shoe increasing the hold it has on the wearer’s foot, allowing the shoe to maintain the person’s natural step. The shoe will be sold on Independence Day in an auction to take place on the Reebok Facebook page. All proceeds from the sale of the shoe will be donated to the organization Crossfit Without Borders which helps people with mental disabilities integrate into the Crossfit community. if the words were shown on the bottom underneath, I would buy it and keep stepping on it. What does "np" on the top of sneaker stand for? No Palestinians? Comment #1...and there you have it.